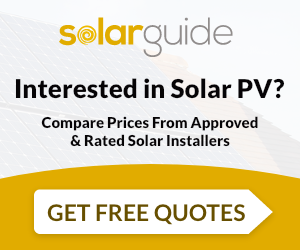 We can source and install Solar PV and Thermal systems from every manufacturer which ensures that our customers have access to many different design possibilities and assured access to the Feed In Tariff (FIT) and Renewable Heat Incentive (RHI). We are also a SunPower Authorised Dealer and can design systems using the market leading panel from the USA which is over 20% efficient. We also install EnPhase micro inverters, SolarEdge and Power optimisers and ground based systems on residential and commercial properties, so please call us today to power up your solution. 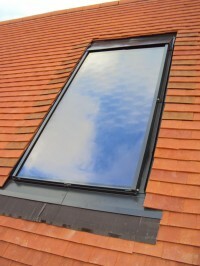 In-roof solar thermal ideal for best aesthetics or new-builds / property developers, this in-roof solar thermal system looks just like a velux window but can obtain the 10% required for planning and looks fantastic ! 10 kwp on a village hall this has built-in fire safety, panel by panel production and monitoring and fantastic shade management systems all built-in. 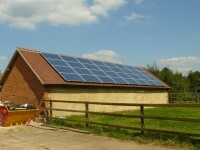 4 kwp sunpower install 20% efficient !! sunpower panels are the best and this install produces more than 30% more energy than that of a good quality normal 4 kwp system. 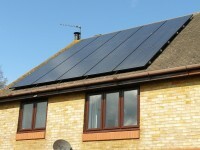 the sunpower all black panels also have the best aesthetic by far !! Some more all black panels all black panels blend in nicely with the roof. Techfor Energy Ltd are MCS accredited engineers who undertake installations of Solar Water Heating and Solar PV. 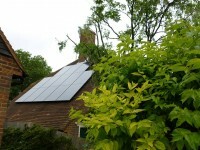 For similar installers in this area please visit the Guildford solar page.